Manage current and future physical facilities of the University. 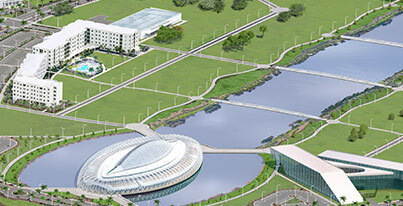 All functions support the mission of Florida Polytechnic University by providing safe and secure facilities for education, research, and community programs through effective planning and programming, budgeting, contract administration, construction, facility operations, and proactive/continuing maintenance. Florida Poly’s standards and procedures as they relate to construction projects for architects, engineers, construction managers and other related professionals. The mission of the Office of Environmental Health & Safety is to protect our students, faculty and staff from danger, risk and injury, while safeguarding our environmental resources. It provides programs to faculty, staff and students that include fire safety training, laboratory training, and more.